Volunteers of all ages and abilities are welcome to drop into our Garden Work Parties to participate in hands-on farm activities. Kids are always welcome but must be accompanied by an adult. 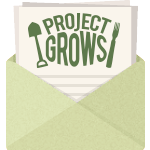 At 6pm we share a free, farm-fresh community meal prepared with veggies from the Project GROWS farm and protein from Polyface Farm. Individuals are not required to sign up in advance for our Garden Work Parties; however, organized groups that would like to volunteer during this time should complete the Group Volunteer form.